I think there is a strong possibility that I am having a mid winter meltdown. I am missing flowers. I need them. I want them. I am thinking that I may go to Trader Joe's tomorrow and get some, but in the meantime I wanted to get some ideas on how to display them. 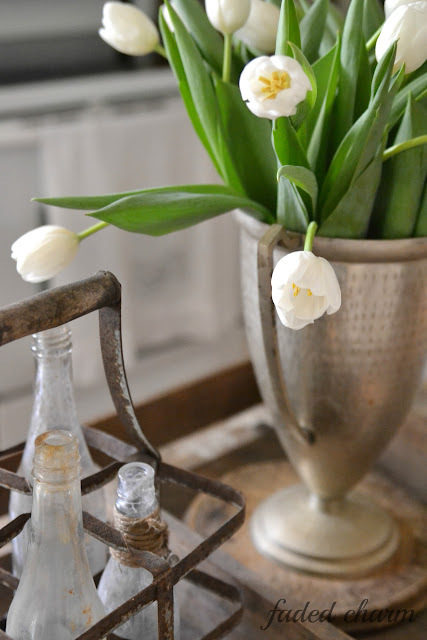 Trader Joe's has lots of tulips right now and I love how these tulips are displayed in an old silver trophy. 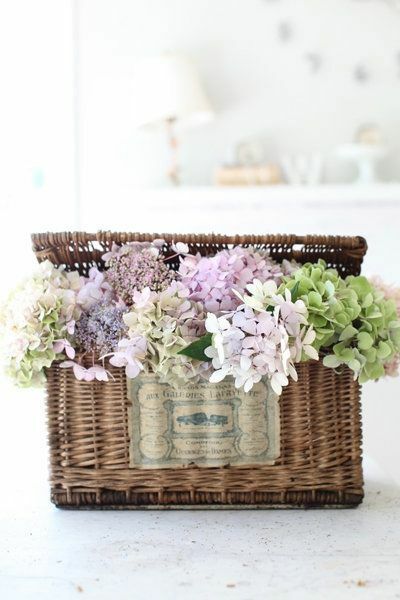 I wish I had an old French basket. Look how beautiful these flowers look inside this one. 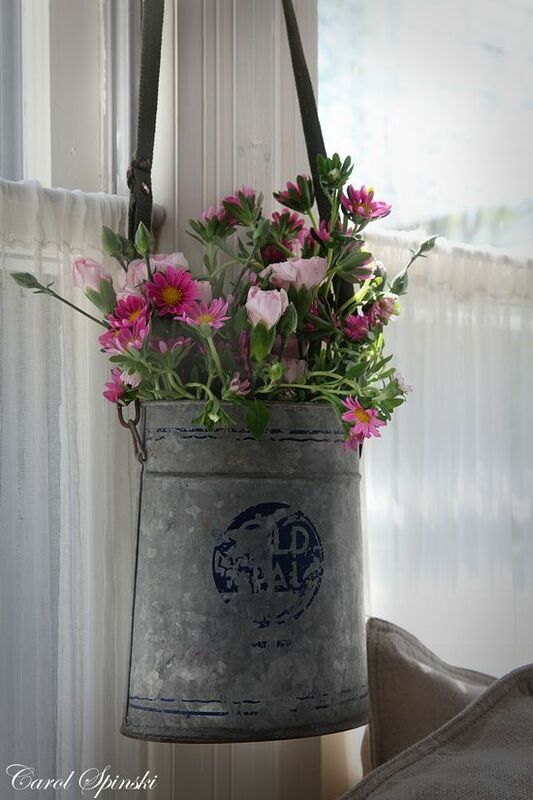 An old primitive metal bait container makes a perfect vase for some spring flowers. I just happen to have an old water can hanging around somewhere. This would be adorable on a kitchen table or in a sunroom. This is a great idea if you have some old canning jars around the house. Applying some gold leaf adds just the perfect touch. 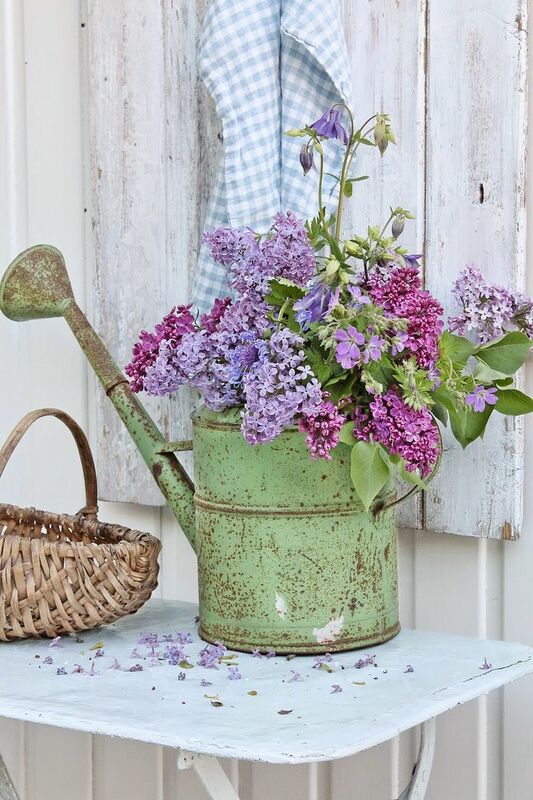 Have you brought flowers into your home to give it a touch of spring? No, I keep telling myself I need some pretty flowers, but haven't been anywhere they had any. There is talk that we may be getting a Trader Joes. Don't know if it's accurate or not. Sure hope so! I hope you get one, Brenda. You will love it. If you're craving fresh flowers then you should go get some! I don't have a Trader Joes close to me, but I've seen a lot of pretty flowers purchased there. I'm wishing we had warmer weather so we could work on our bathroom project. Oh well, I have to remind myself that it's January! It's so hard to get through these winter months, Kelly but it seems like January has resolutions by this year. I'm sure you will be getting some warm weather in Georgia before you know it. This is always a hard time of the year for me, but January is almost over. I remember when I lived in California that this was one of my favorite times of the year. The winter doldrums get us all down. I was thinking of buying flowers to brighten the house and a flower delivery arrived. My daughter sent me a bouquet of yellow roses and daises for my birthday. The roses even smelled like roses! They sure brightened my day and will continue to do so for a few days. Yes, definitely! I think flowers help me keep my sanity in dreary old winter. It's really funny that I was in Trader Joe's today and was excited about those $3.99 flowers. But they were all the same old mums...I know, it's sad to not like any sort of flower, but they need to mark down the pretty ones!! The tulips were $9.99. Geez, in 3 months I will have multiple bouquets for free. That doesn't help those who don't have them but still...Trader Joe's doesn't seem to have deals much better than the ordinary grocery stores. At least not today. Great photos!! Wonderful pick-me-up for this morning! Have a great weekend.